"This is Ollie. 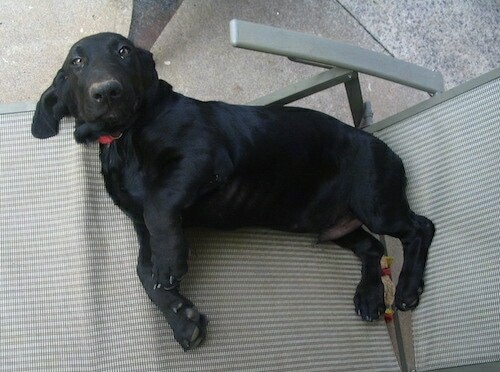 He is a Basset Hound / Labrador Retriever mix. 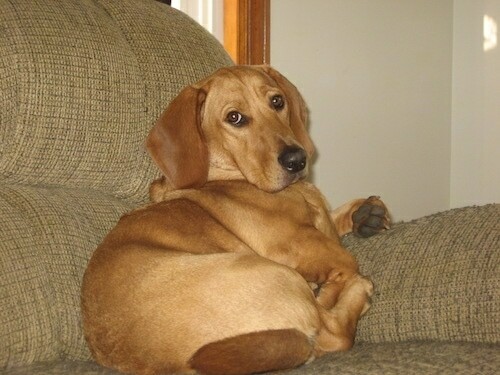 Ollie’s parents were both purebreds and neither owner wanted the mix so we gave him a home. He is a very loving dog and is wonderful around people, especially the elderly and children. He’s very gentle when he needs to be and volunteers at nursing homes as a pets on wheels dog. On the other hand, he’s also very stubborn and likes things to be on his terms. By this I mean if you want him to come inside, he’ll wait until he’s ready, If you call his name he'll act like he doesn't here you. He likes the water but isn't much of a swimmer with his little legs. He loves to retrieve!! He has a great nose and can smell absolutely everything. He loves walks but also just likes running in the fenced-in yard. His energy level isn't as high as a Lab, but more like a Basset Hound. He also has a basset hound bark! He is very food driven when it comes to training, that’s one way you’re guaranteed he’s going to listen to you. Ollie really doesn't have any bad habits, he’s the best dog I've ever had and I’d recommend his mix to anyone who is looking for a good companion for themselves or another animal." The Bassador is not a purebred dog. 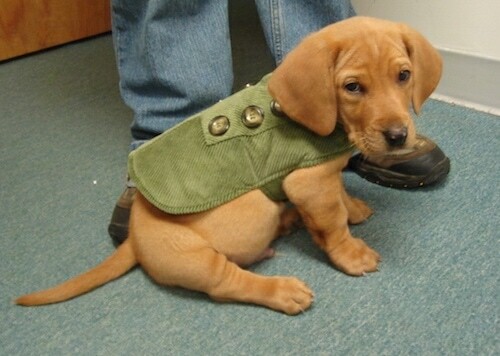 It is a cross between the Basset Hound and the Labrador Retriever. The best way to determine the temperament of a mixed breed is to look up all breeds in the cross and know you can get any combination of any of the characteristics found in either breed. Not all of these designer hybrid dogs being bred are 50% purebred to 50% purebred. It is very common for breeders to breed multi-generation crosses. "Ollie as a 9-week-old puppy (left) and Ollie as an 11-month-old dog (right)—here is a picture of my dog Ollie. 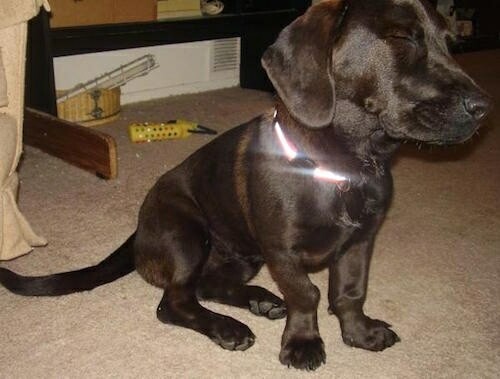 He is a Basset Hound / Labrador Retriever mix. My fiancé and I came across Ollie one day at a small animal pet store. Someone had dropped him and his brother off that morning because they didn't want mixed-breed dogs. Well, we couldn't resist him. Ollie was the bigger of the two; he was very alert and so calm. When I picked him up he sighed in my arms. We went home to think about it and the following day we picked him up. His brother was adopted the next day. Ollie was 2 months when we found him and now he is almost 11 months old. 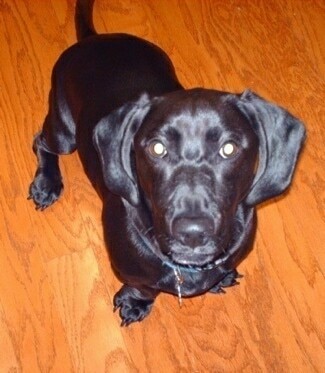 He is the best combination of a Basset Hound and a Lab I've ever seen. He is so good with children and other animals; I have a few nieces and nephews varying in age from 5 to 11 and he's their best friend when we take him back home (PA). He gets along well with my two cats, although he does chase and hunt them through the house but would never harm them. He's got a nose on him that can smell absolutely everything. 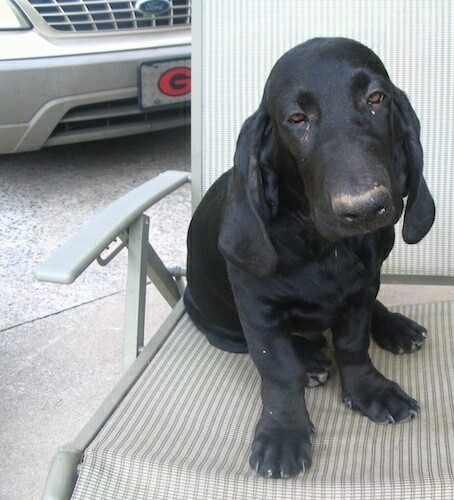 He weighs about 47 pounds and his stature favors that of a Basset Hound. Ollie is very stubborn at times. We can't take him outside without a leash because he smells something and runs the opposite way, but if we're in an open field or a large area he'll tend to stay closer to us. He's started chewing lately, on pretty much everything he can get his mouth on but he's sharp so with a little reprimanding he should be okay. Potty training wasn't that bad except he wasn't very vocal when he wanted to go outside. So we decided to put a cow bell on the door and now he rings it every time he has to go outside." 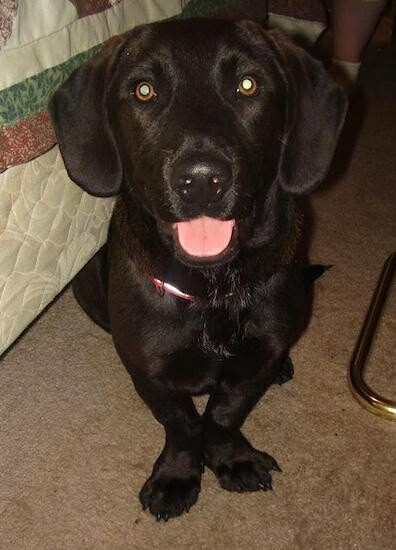 "This is Kash my 8 month old Basset Hound and Labrador Retriever mix. 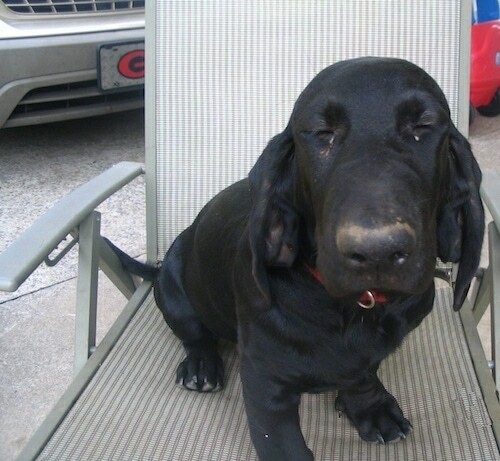 His mother is full blooded Basset and his dad is a chocolate Lab. He is full of energy like a Lab but clumsy like a Basset. He loves kids and attention. 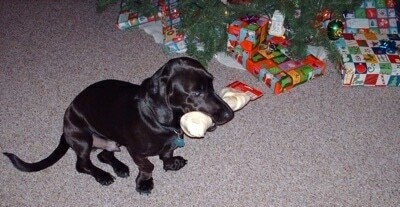 He is happy to have a good bone to chew and someone to scratch him behind his big ol long ears." 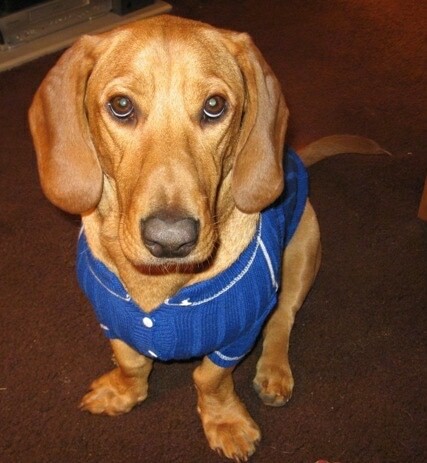 Rocky the Bassador at 2 years old—"Rocky is half Basset Hound half Labrador. 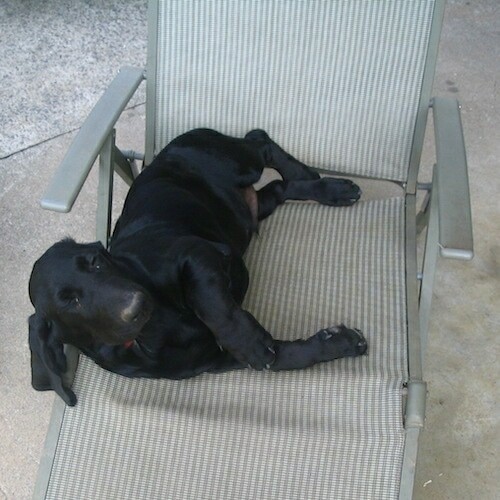 He is a great dog, very motherly, loves cats, and people, chews up everything that is not nailed down and loves to sing." Jake the Bassador at 2 years old on the beach—"This is Jake our very loveable, sweet, handsome boy! Jake loves to hunt, fish, and play with his toys. We adopted Jake from our local shelter at age 10 months. He has truley become our best friend and companion. We love you little boy!"